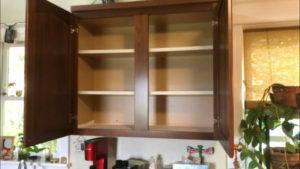 Cabinets should always be firmly mounted to walls to prevent accidental detachment. However, many existing cabinets in homes lack necessary support! 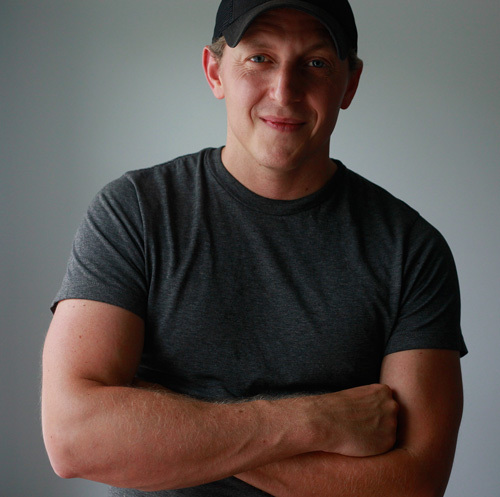 This short article and video will show you easy ways to enhance your cabinet strength. 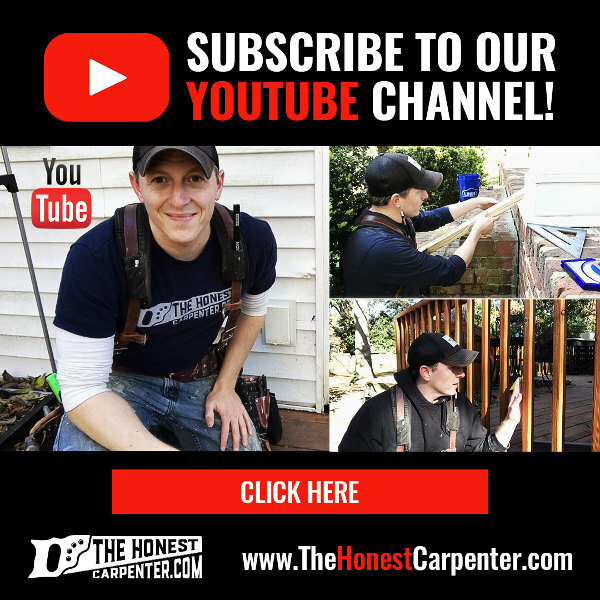 You’ll learn the best locations for fasteners, the best types of fasteners to use, and also a few tips on how to set fasteners easily. Most all American cabinets are made with face frames–flat, outward-facing trim pieces that dress up the front of the cabinet and hide the plywood edges of the cabinet body. The existence of these face frame pieces also allows the walls of the cabinet to extend past the floor and ceiling of the cabinet. This design creates little ledges–or rails–along the top side and underside of the cabinet. 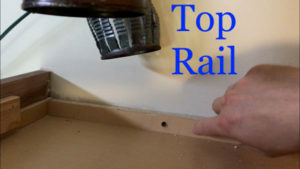 These rails are by far the most effective place to install fasteners. Their location above and below eye level help keep screws out of visible sight lines. Also, cabinet manufacturers will often make these rails 1/2″ thick–thereby providing strong material to mount screws through. Of the two rails, the top rail is the most ideal location for fasteners. It sits up near the ceiling, and not even the tallest of people will be able to see it. It is also the most sensible place to install fasteners from a structural viewpoint. Screws driven through the top rail allow the cabinet to hang suspended from its highest point. BUT, I would never consider two screws in the top rail alone to be enough support for a cabinet! 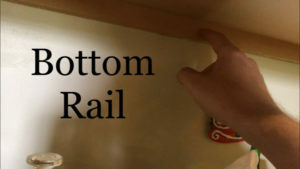 The bottom rail is virtually identical to the top rail, making it the other ideal location for fasteners. Screws through the bottom rail help pin the cabinet to the wall, preventing it from wanting to “swing”–or pull away–from the wall surface. They also act as a backup for the higher fasteners, should something ever break or give way. In a pinch, the back wall of the cabinet can also provide a possible location for fasteners. It has unlimited surface area, and it is an integral part of the cabinet body. However, the back wall of the cabinet is often only 3/16″ of an inch thick! A screw driven into this material can punch right through it with ease, thereby eliminating all of the screw’s structural value. 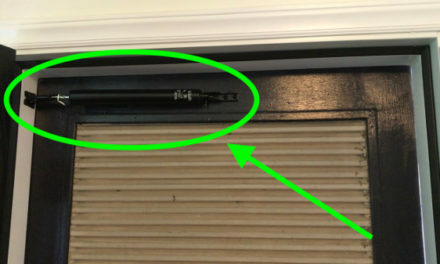 If you want or need to set screws through the back wall (possibly because the rails are inaccessible), do so carefully. You might consider using small washers to create more surface area for the fastener, or using truss-head screws. Also, to better hide these fasteners, consider putting them just above a shelf. This will make them less visible when viewed from below. Inspect your cabinets and assess the number of fasteners–and the locations of fasteners–used to mount each one. If you can’t account for 4 fasteners in strong locations in each cabinet, you may want to consider adding more. Fortunately, this process is really easy! 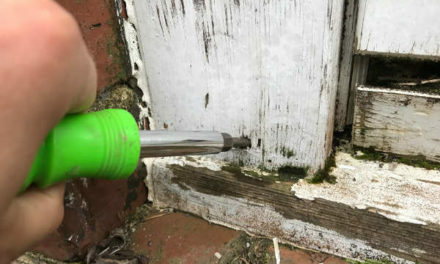 The most important step is locating studs to fasten into. Cabinet fasteners must penetrate into structural wood in the wall to be genuinely secure. 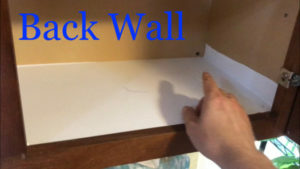 Drywall alone isn’t strong enough to hold a cabinet! To get an idea of where studs are located, first check out the existing screw locations in the cabinet. 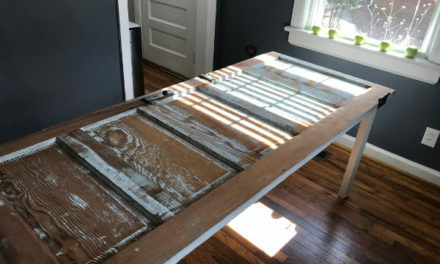 The carpenters who originally hung the cabinet should have attached them to studs. You can confirm this by knocking on bare wall at these points above or below the cabinet. 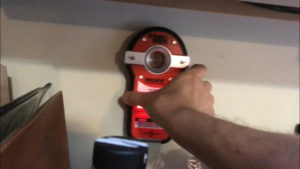 Or, you can also use a stud finder if you have one. When you have confirmed your stud locations, drill a hole in the rail you want to attach through using a drill bit (up to 7/64″, based on your fastener width). It can be difficult to drill directly into the rails, so you may have to drill at a slight angle. Now, use a drill or driver to install a fastener in this pre-drilled hole. 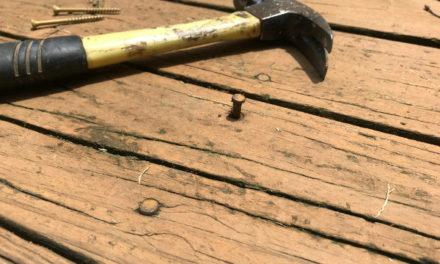 I like to use 2-1/2″ exterior screws. 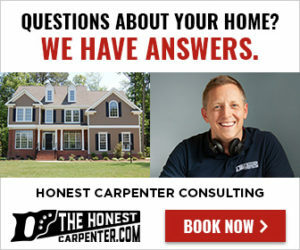 They have enough length to get through the 1/2″ of cabinet, 1/2″ of drywall, and still embed 1-1/2″ of fastener into the stud. And, they’re extremely strong. Drive the the screw until the head is just flush with the face of the rail. You’ll probably feel it grab the stud in the wall, and you’ll see the screw head bite into the wood of the rail. When the screw is fully driven, you’re successfully attached. 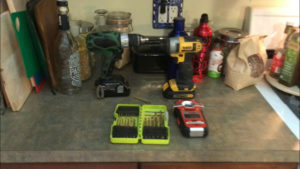 Add additional fasteners anywhere that a cabinet seems under-supported, or anywhere that you can’t account for 4 existing screws. You even check current screw locations just to be sure that they’re actually centered on studs. In the end, you really can’t have too many fasteners in a cabinet. Good luck!